Finding Marco was interesting. It has a lot to offer, I’ll give it that. Business, law, ethics, personal struggle, and then — old world Italy. I have to applaud Kenneth Cancellara. He has taken his experience, his knowledge, and his background, and crafted it into a story that is timely and profound. I found it a little curious that the main character, at the height of his dilemma, chose to leave his family behind and embark on a journey of self-discovery alone, on the other side of the globe. But, hey, it’s his journey, not mine, so I let it go. It doesn’t stand in the way of the story, nor is it that crazy, in the whole scheme of things. Learning about the traditions, the culture, the people, and the landscape in Italy was a delight. For example, who would not be enchanted by la passeggiata, the tradition wherein people take their nightly stroll, mingling with friends and neighbors and enjoying after-dinner drinks. Sign me up! Cancellara weaves together a well-written novel that addresses salient issues like priorities and morals and does so without sounding preachy. 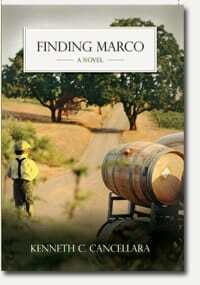 I was happy to read Finding Marco and, truth be told, a little jealous that the main character got to do his soul-searching in his hometown of Acerenza.